Don’t think about abusing her in Premium with Globe Magus, because rulings say that she only powers up once in that case. Anyway, this is more often than not your first ride in OTT. You get to +1 every turn, unlike Imperial Daughter who only gets one on-ride, and her power-bonus is good on either RG or VG circle, so at least you have a source of pressure and you don’t feel compelled to ride constantly. Not much to really say after that though, although I would have still liked to get a free scry like old CEO, although if it’s going to strictly +1 you, fair enough for it to carry a cost. What’s up, Rogue Squad?! For our last card for this week (and my last card for a while), we have the original boss of OTT, Amaterasu. The one thing you’re going to abuse the most about Ammy is that she gets +5k for every time you have to look, search or reveal cards from your deck. In short, the more deck manipulation you can do, the stronger Ammy is going to get. 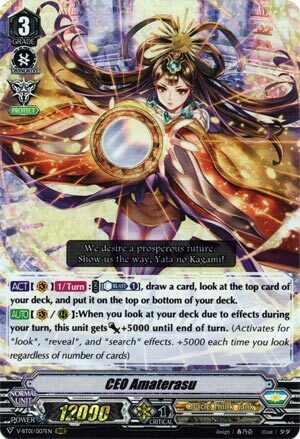 Unfortunately, it’s not as exploitable as people think in Premium, as Globe Magus isn’t able to stack with Ammy as she only gets 1 power-up, but that still doesn’t stop her from being a potential threat and a solid backup Grade 3 for the Daughter. Previous articleYu-Gi-Oh! Funko Pops! Coming Soon!